Course begins at 7:30 a.m., with proctored testing at 3:30 p.m.
Get your Food Protection Manager Certificate (CFPM) license with this one day course. The Illinois Department of Public Health (IDPH) and the Chicago Department of Public Health (CDPH) approve the course for the Person-In-Charge of a food operation, also known as the Food Service Sanitation Manager (FSSMC). ANSI-CFP approves the ServSafe or National Registry of Food Service Professionals (NRFSP) examination that follows. Certified Food Safety Programs will guide you through the process and proctor the test. We send you a study guide once you register for your course. The guide contains the facts and figures you’ll need to know for the test, and multiple choice questions to practice. If for any reason, you miss the class and have to reschedule – the registration is valid for a full year. The registration can also be transferred to another employee if needed. In the class, we discuss the hazards and regulations of food safety. Ask questions and practice more multiple choice questions. You will get a thorough review of food safety before taking the examination. The course meets at the Hampton Inn Chicago Midway Airport 6540 S Cicero. The location is convenient to the CTA public transit “Orange Line” and has free parking in the hotel lots. We begin at 7:30 a.m., and end with the proctored licensing examination at 3:30 p.m. The food code in Illinois mandates the completion of an approved eight-hour course in addition to the proctored licensing exam. This licensing course can be taken in-person or on-line. However, travel to a testing site is always needed for proctored supervision of the exam. Many managers find it easier to attend a class in person to get ready for the licensing test. Taking the course and test in person costs less with Certified Food Safety Programs as well. Choose either the ServSafe or the National Registry of Food Service Professionals (NRFSP) test. Both are certified by ANSI-CFP (American National Standards Institute – Council on Food Protection) – required by most state health departments. 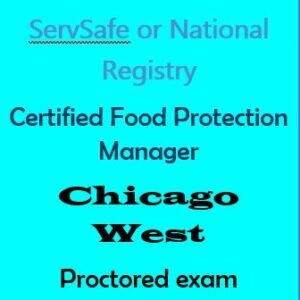 So, these exams are approved for a food safety manager, also known as the “person-in-charge”, in Indiana and Wisconsin. The test may be taken with paper and pencil, or with a laptop computer.